The color purple, perceived as a combination of the colors blue and red, though of a much lighter shade than those with the same combination—violet, indigo—is often associated with royalty, nobility, and luxury. According to the science of colors, purple combines the calmness of blue and the fierceness of red. Aside from those mentioned above, purple is also associated with wealth, creativity, wisdom, dignity, pride, and magic. You may also see Surprise Birthday Invitation. Based on that symbolism, many people would incorporate the color in a lot of formal and luxurious events, though others would also use the color simply because they like it. Whatever the reason behind its use, if you are planning a purple-themed event and are looking for invitation templates with a matching theme, then you have found the right place. Below is a collection of purple invitation templates that you can download and use for your own event, feel free to check them out. But first, you may also want to check out our list of tips on how to write a great invitation. Do you like bokeh effects? 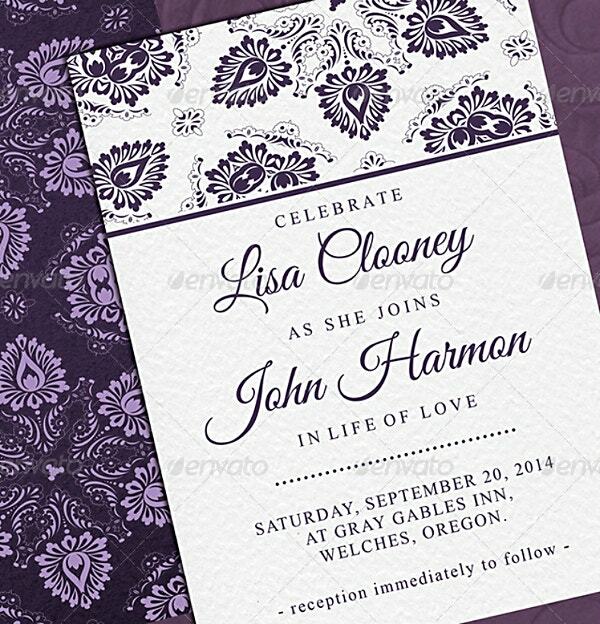 Even if you’re not a fan of it, you will from looking at the purple wedding invitation template above. As you can see from the image, the background of the invitation has purple orbs all over it, resulting in a bokeh-like effect. When making a wedding invitation, you may also want to consider reading our list of wedding invitation mistakes that you should avoid..
Let’s face it, who doesn’t love friends? Many people love the sitcom so much that until now they are still looking forward to at least a reunion show. If you want to hold a friends-themed birthday party, then the birthday invitation template above may be what you need, just make sure to inform your invitees beforehand that they should also be in character when they go to your party. 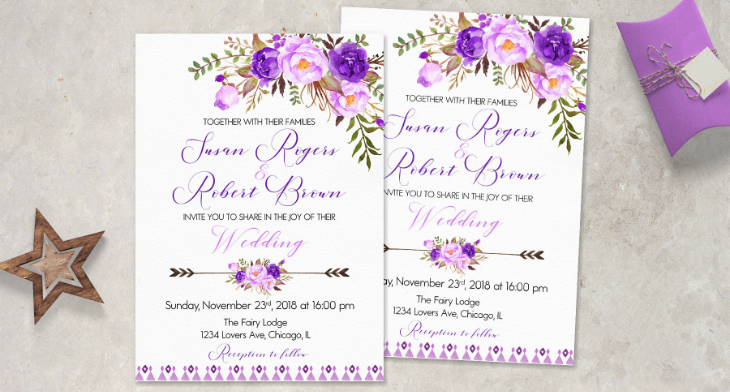 Above is a purple wedding invitation template that appears to have been done by watercolor, and the uneven colors on its background are enough to make it look like a genuine watercolor art. 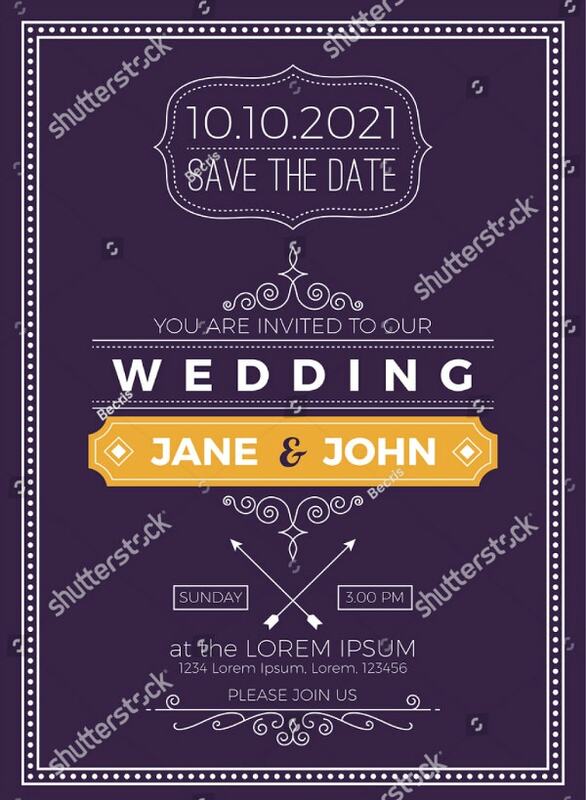 If the motif of your wedding is purple, then this invitation template would be a perfect choice. Also, you may want to read the etiquette of writing wedding invitations. 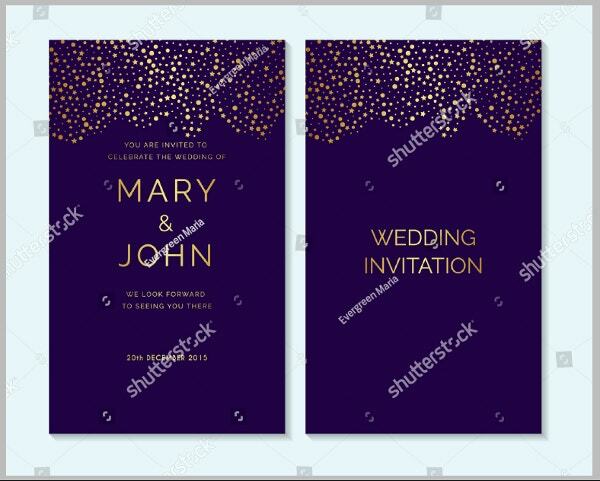 Earlier, we did mention that purple is used to represent luxury and extravagance, and from the invitation design above, purple is paired with gold which makes the design look even more luxurious. This purple wedding invitation template leans more towards typography design, though there is also the presence of an ornate border to further enhance the quality of this elegant template. 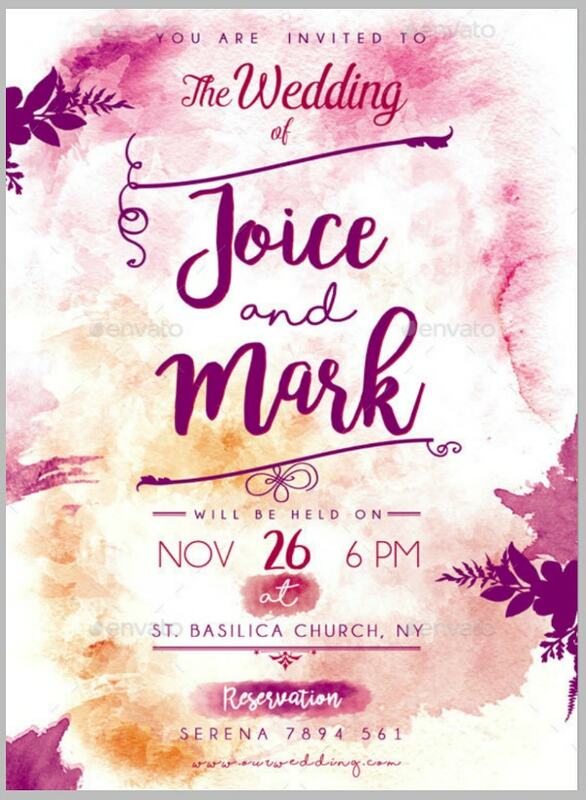 Perhaps you would also want to make use of invitations for a bridal shower event, because we may just have the event invitation template for that purpose. 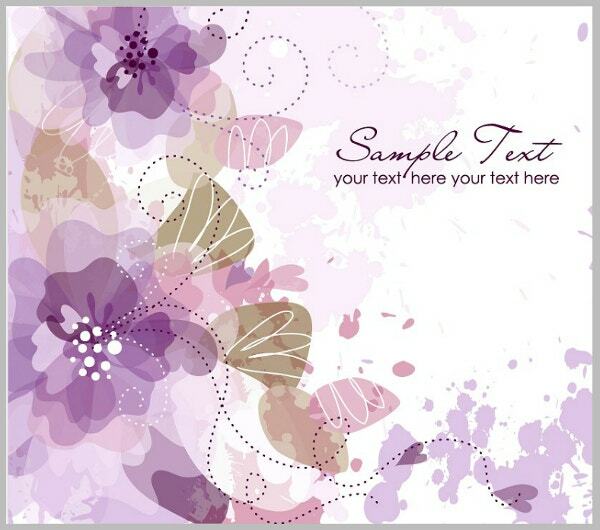 Above is a bridal shower invitation template which contains a gold-framed text box, a purple-background, and a pair of purple flowers on the corners. 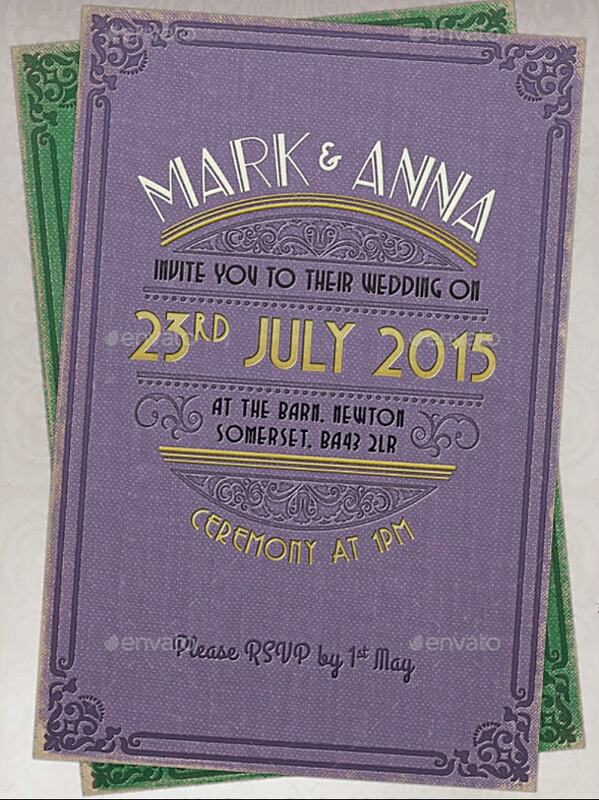 Were you able to find what you need from our collection of purple invitation templates? We hope you did since all of them are of top-notch quality and were created by highly talented graphic designers from all over the world. Just by getting a glance at those design templates, you can already assure yourself of invitations that are sure to captivate your invitees. But continue reading on to find out other awesome characteristics behind our invitation templates. 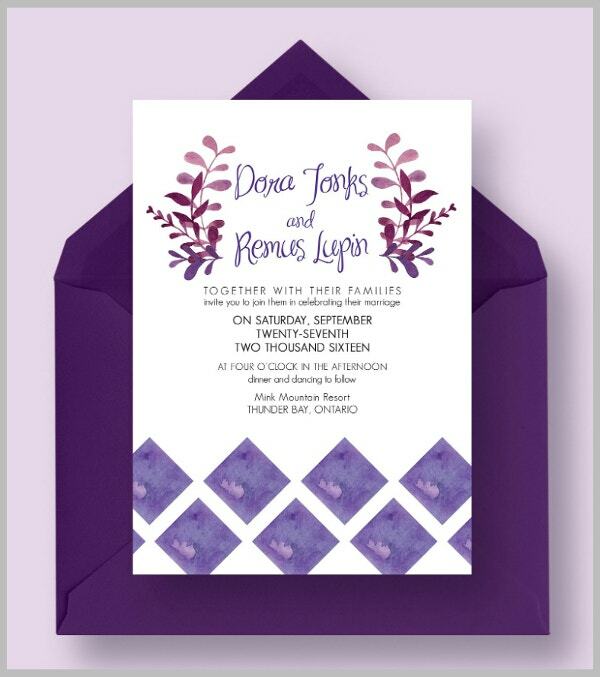 Another thing that we can share to you with regards to our purple invitation template is that you can get your hands on them without spending a fortune. All these templates are priced very reasonably in order to make them convenient and accessible even by those who are on a tight budget. Lastly, these invitation design templates are fully editable, and you are also allowed to edit each element individually. This way, it further gives you the freedom in trying to pull off the design that you have always wanted, all while preserving the template’s awesome quality. So what are you waiting for? Scroll back up and download the template that works for you.